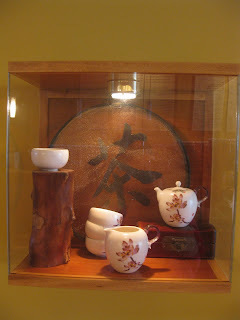 This week I had the distinct pleasure of introducing Jane to the ZenCha Tea Salon on North High Street. She fell in love! Just as I had when my husband and I had Sunday brunch there a few months ago. First of all the ambiance is just simply wonderful. There is a gentle calmness about the place that to me is quite soothing. 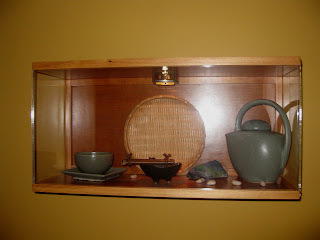 The walls are adorned with framed tea sets of all different types. I would love to know the history behind them, as I am sure each must be unique in its own way. The interior is rather sparse, but still very inviting. 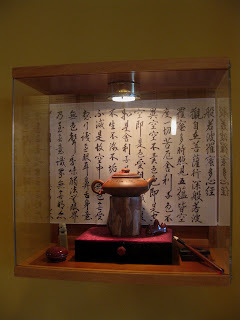 The tea menu is so wide and varied that there is no way I could even try to do it justice here. The staff is highly trained and is more than willing and able to assist you in making a decision. On this visit I chose the Fresh Fruit Tea Summer Blend. It was absolutely delightful! Oh my goodness, the taste was so clean, crisp and refreshing. There were chunks of fruit in the bottom, and it was iced. The tea was presented in an upright clear glass teapot with a strainer, poured into a clear class cup with saucer. At first it seemed a bit odd to be drinking iced tea from a cup, but it soon began to feel like the most natural thing in the world. 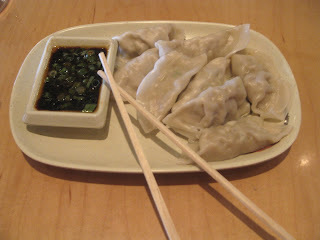 We started our lunch with an order of the Chinese Chicken Dumplings. I was surprised to learn that Jane had never had Chinese dumplings before. How could this be? I consider myself a dumpling connoisseur (it’s a carbohydrate thing) and I couldn’t fathom never having had Chinese Dumplings! Turns out this was a great place to introduce her to them. The dumplings arrived perfectly steamed, accompanied by some of the best dipping sauce I have ever had. Awesome. Teaching Jane to use chopsticks…well, we still need to work on that. In the interest of providing my readers with the most accurate and update information, I decided to try a couple of menu items rather than just limiting myself to one. Yes, I am that selfless. One of the problems at ZenCha however, is that everything on the menu looked delicious! And it was going to be pretty difficult to top those dumplings. After much, and I do mean much, deliberation we decided! Jane ordered the Tandoori Chicken Lettuce Wraps. They looked (and were…I “sampled”) delicious. The plate really was lovely. There were great big beautiful romaine lettuce leaves and plenty of perfectly seasoned chunks of chicken. To garnish the wraps there were sliced cucumbers, julienned carrots and chopped scallions. The dish is served with three sauces. The tandoori yogurt sauce I believe (but you know I could be sooooo wrong) is made with yogurt, a curry spice mixture, parsley and lemon juice. The nuoc cham is a Vietnamese sauce made with chili paste, fish sauce, sugar, water and lime juice. And the last is a Chinese mabo sauce which is a complete mystery to me. But all were very good. 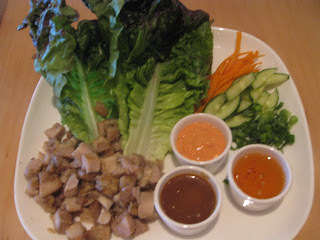 The nuoc cham was Jane’s favorite, as well as mine. Again I must reiterate that in the interest of my readership I ordered more than I knew I could eat at one sitting. But hey, Bob was out of town so the leftovers were going to be dinner. Excellent planning on my part! I opted first for the pita pizza. I started with the garlic butter and mozzarella. 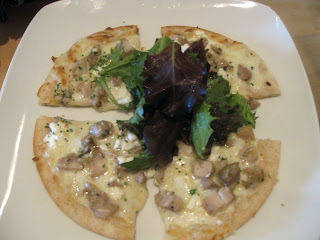 On the chef’s recommendation I added chicken and goat cheese. It came out looking yummy. In the middle of the cut pizza was a pile of fresh greens dressed with a light, slightly sweet dressing. Topping the pizza with this just put it over the edge. I kid you not my taste buds were doing a most sophisticated tango! This pizza rocked! Jane bit into a piece and right there, in the middle of the ZenCha dining room, my friend had a “moment”. I can’t wait to go back just for that pizza. Then my second order was delivered to the already overloaded table. Side note: They really should make those tables bigger. It made us look so much less dainty than we really are! So anyway, my soup arrived. Tonkatsu ramen with sautéed vegetables and pork. This was just downright incredible. I loved it! The broth was so flavorful, but mild. The ramen noodles were fresh; no packaged fried ramen noodles in this soup! There was just enough cabbage and carrots and the pork was perfectly cooked; two nice big slices of pork, and a sprinkling of spices finished off the dish. I really truly enjoyed this a lot! If I had to pick which dish was my favorite I simply could not do it. Everything from the dumplings to the tea was just spot on delicious! And I thought their weekend brunch rocked!!! Now I need to say that for those of you that do not already know, this is the fine establishment in which Laura Lee practices her culinary talents. However, I would truly have told you if there was anything that did not work for me here. But in all honesty, everything I have ever tried here is just awesome. Oh! Speaking of awesome…. Jane treated us to dessert! It was her choice and she narrowed it down to the crème brûlée. Then the next decision had to be between the lavender or the chai. We both agreed on the chai crème brûlée. An excellent choice. Was it ever! 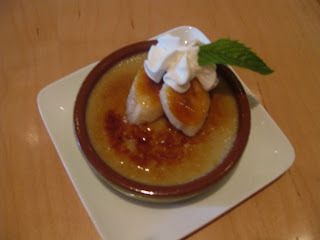 A ramekin of the velvety smooth custard was topped with a crisp layer of caramelized sugar, two slices of caramelized bananas, whipped cream and a mint leaf. Perfectly executed! It wrapped up a delightful lunch. This was everything that crème brûlée should be. Perfect! 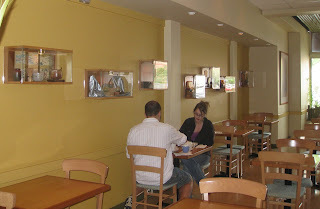 If you have the opportunity to dine at ZenCha, please embrace it! 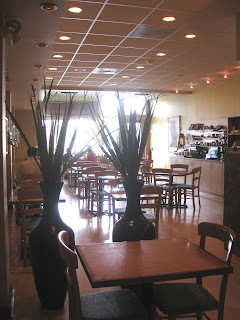 From the peaceful ambiance to the delicious menu, you will enjoy every moment. And tell L3 “hello”! Thank you for coming in and for the awesome support at the Asian Festival. 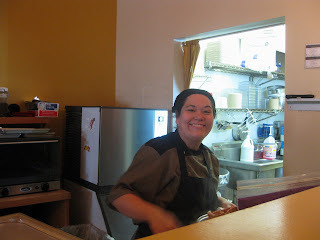 :) Now we just have to get you back in for brunch!